If you’ve ever had tabbouleh salad before, you know how delicious it is. But the fact that it’s traditionally made with bulgar (a grain), the Points can really rack up quickly due to the high amount of carbohydrates. By simply replacing the bulgar with grated cauliflower instead, you get a dish that tastes ridiculously similar to traditional tabbouleh, but for just 4 Points per serving. Its light and refreshing flavor makes this side salad a wonderful accompaniment to your favorite meal. And it’s slam packed with vegetables, so you get a nice healthy dose of those, too. Now, some people may argue the Points value on this Weight Watchers recipe, due to the fact that except for the olive oil, everything else is 0 Points when eaten alone. However, my Weight Watchers leader said that when you combine all the vegetables together in a recipe like this, it changes the structure and can therefore raise the Points value. So, what I did here was calculate all the nutritional information for each ingredient, and added it all together. Then entered it into my Weight Watchers Points Calculator, and came up with 4 Points per serving. If you are counting just the olive oil, it’s 2 Points per serving. Either way, it’s a great bargain and absolutely delicious side salad recipe. This is a MUST try, folks! 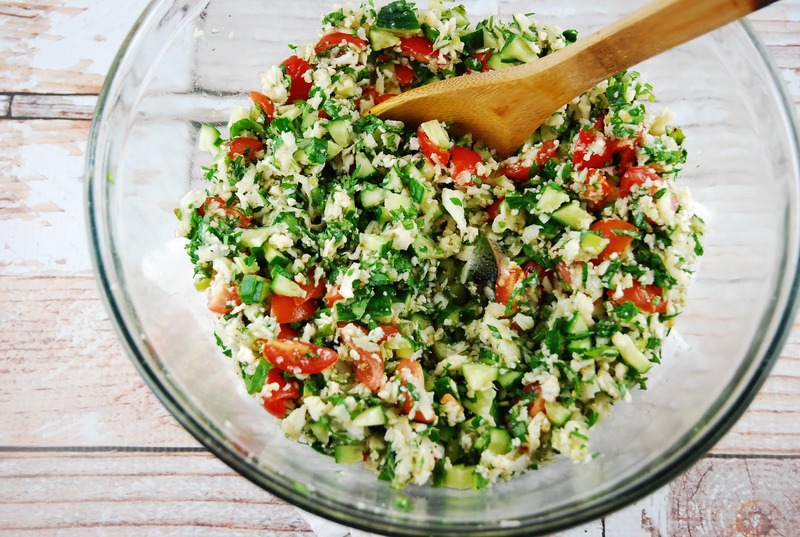 Light, fresh, and flavorful, this traditional tabbouleh recipe replaces the high-carb grains with low carb cauliflower, making it lower in Weight Watchers Points, but still delicious. Using a food processor or grater, grate the cauliflower finely until it resembles rice. (The cauliflower crumbles very easily and this is really easy to do with a traditional grater if you don’t have a food processor). Combine grated cauliflower and remaining ingredients in a large bowl. Toss until well combined and season with salt and pepper as desired. Refrigerate for 30-45 minutes before serving. Mix again well before serving. I have made this several times, and it’s always outstanding. I’ve made it with both fresh and frozen cauliflower. For the latter, I partially defrost it in the microwave, first. For both fresh and frozen, I use the grating blade on my food processor. The regular chopping blade will work, if you don’t have the grating, but be sure to pulse so that you don’t end up with some big and some pulverized pieces. The fresh herbs are a must for the best flavor. Thanks for this and all your other fabulous recipes. Even for those of us who are not on the WW plan but are watching our diet, your website is a gift. I actually tried out this recipe yesterday, because I love cauliflower, but my family doesn’t, so I really needed a sort of incognito way to slip it into their meal :) and they loved it! They didn’t even know there was cauliflower in it, which is exactly what I was going for. This really inspired me to look for more “camouflage” recipes to put in my blog, because I bet there are other people who could benefit from them.